It’s easy! Shelor Toyota will donate $100 to your school when your family and friends purchase a vehicle. Just pick up a donation card from your school’s PTA/PTO. These can be found in the Main Office. Shelor Toyota will donate 2 vehicles for the 2017-2018 school year. Each school will sell “Chances to Win the Car” throughout the school year and the school keeps all proceeds. All tickets are sent to Shelor Toyota. We will draw the winner of the vehicles in the Fall of 2017 and Spring of 2018. 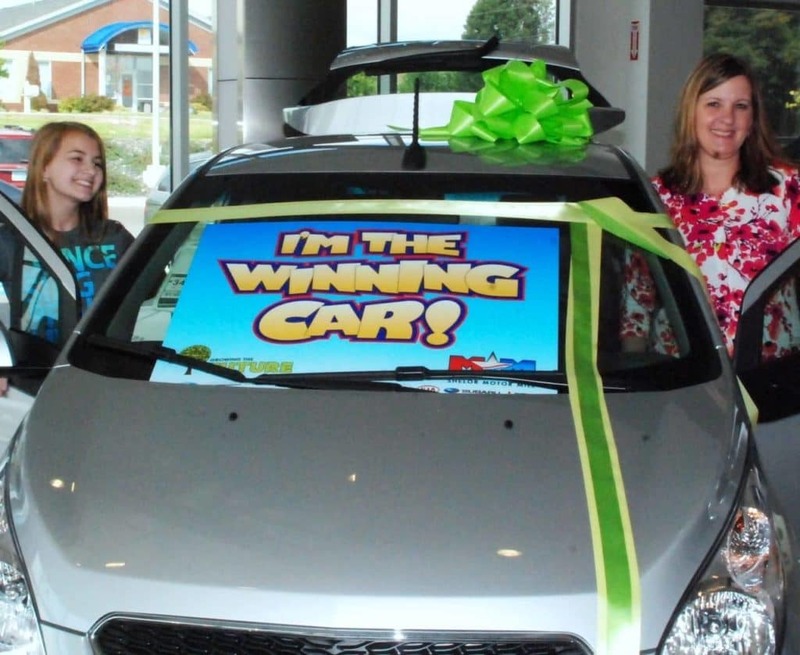 The winner of the Shelor Motor Mile Growing the Future Community Partnership Car Giveaway is Christina Bradley. Bradley purchased her ticket to support McCleary Elementary School in Craig County, and she is now the owner of a new 2017 Mitsubishi Mirage. 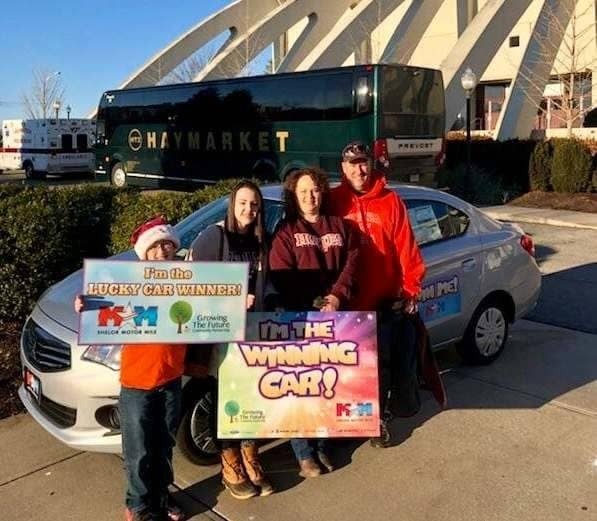 “I never thought my ticket would be pulled,” Bradley said, “but winning this car is truly a blessing.” The Car Giveaway celebration was held at the Virginia Tech men’s basketball game on Sunday, December 10th at Cassell Coliseum. The top three finalists were present and the winner was drawn live during half time of the game. The 2nd and 3rd place winners walked away with a $250 Matt Hagan Outdoors gift card. Local elementary, middle, and high schools sold over 58,000 car raffle tickets at $1 each. With the Growing the Future program, schools keep 100% of the proceeds from those tickets. Shelor Motor Mile plans to give another car away in the spring of 2018. Shelor Motor Mile gave away a brand new vehicle on Saturday, May 20th at the Demolition Derby event which was held at the Motor Mile Speedway in Radford, VA. Over six million dollars has been contributed to schools in the Counties of Craig, Montgomery, Pulaski, Giles, Floyd, and Radford City since the inception of the Shelor Growing the Future (GTF) Community Partnership. The Growing the Future program allows Shelor to invest in the youth of the local community through scholarships, donations, teacher incentives, partnership programs, marketing assistance, Talent Show, and so much more. “This program has such a positive impact on the community, as well as our teachers, staff, families & students!”, said Kevin Siers, Superintendent for Pulaski County Schools. 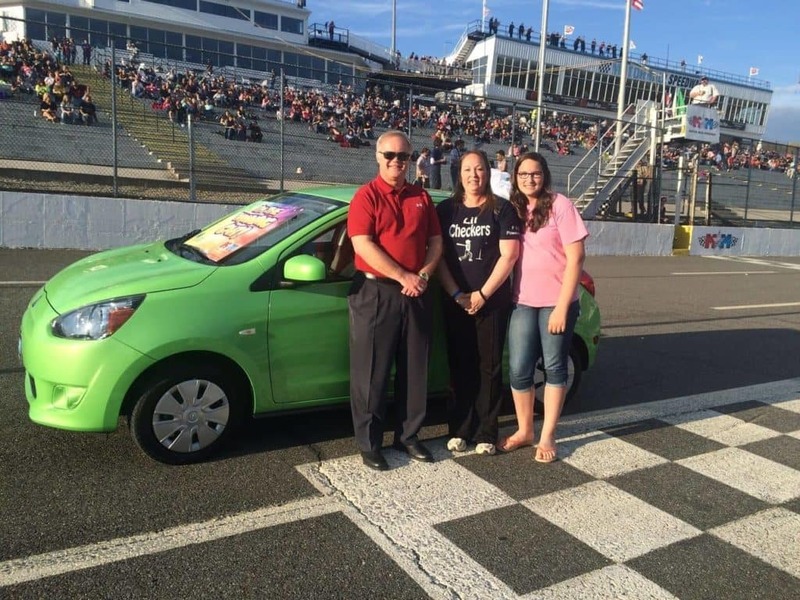 Three finalists were selected to be present for the car giveaway at the Demolition Derby event at the Motor Mile Speedway. Anthony Hess, winner of the car, bought his lucky ticket at Eastern Montgomery High School. The other two finalists walked away with a $500 Matt Hagan Outdoor’s gift card. 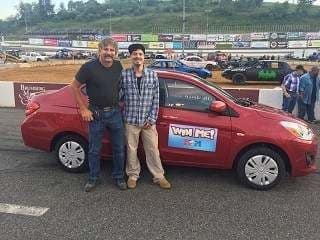 The winner of the Shelor Motor Mile Growing the Future Community Partnership Car Giveaway of a 2017 Mitsubishi Mirage is Mark Windle. Windle purchased his ticket to support Pulaski Elementary School. “Being a Veteran, this was the best gift to receive on Veteran’s Day”, said Mark Windle. “I’m very grateful”! 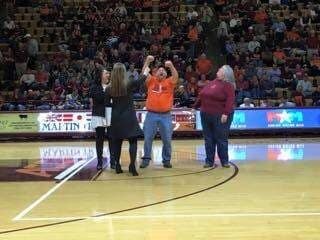 The Car Giveaway celebration was held at the Virginia Tech Men’s Basketball game on November 11th at Cassell Coliseum. The top three finalists were present and the winner was drawn live during half time of the game. The 2nd and 3rd place winners walked away with a $500 Matt Hagan Outdoors gift card. Local elementary, middle, and high schools sold over 60,000 tickets at $1 each. Schools kept 100% of the proceeds. Shelor Motor Mile plans to give another car away in Spring 2017. The winner of the Shelor Toyota Growing the Future Community Partnership Car Giveaway of a 2015 Mitsubishi Mirage is Barry Beadles. Thanks to co-owner of Shelor Toyota , David Hagan who drew the winning ticket. Akers purchased her ticket from Craig County High School. The Car Giveaway celebration was held at the Growing the Future Talent Show Finale at Blacksburg High School. The top five finalists were present and all walked away with Matt Hagan Outdoors gift card. Mary Tucker, PTA staff at Christiansburg Elementary School said “CES is so thankful for the support of Shelor Toyota . We have been able to provide for many events with the Growing the Future program. This money helps with field trips and other student needs throughout the year”. Local elementary, middle, and high schools sold over 50,000 tickets at $1 each. Schools kept 100% of the proceeds. Shelor Toyota plans to give another car away in Spring 2016. The winner of the Shelor Toyota Growing the Future Community Partnership Car Giveaway of a 2015 Mitsubishi Mirage is Melissa Akers. Thanks to co-owner of Shelor Toyota , David Hagan who drew the winning ticket. Akers purchased her ticket from Check Elementary School. “I never dreamed I would win a car, but I give God all the glory. I prayed he would give the car to the person who needed it most”, said Akers. The Car Giveaway celebration was held at the Motor Mile Speedway before the race began. The top ten finalists were present and all walked away with a prize. 6th-10th place winners received $100 Matt Hagan Outdoor gift cards, 2nd-5th place winners received cash prizes totaling $1,400. Gary Bradshaw, PTA President at Check Elementary School said “Check Elementary is so thankful for the support of Shelor Toyota . We have been able to accomplish many projects with the Growing the Future program. We raised almost $6,000 this year alone with the ticket sales and car reward certificates. When looking for a car, we encourage all our teachers, staff and parents to support Shelor in the way they have supported us”. Local elementary, middle, and high schools sold over 50,000 tickets at $1 each. Schools kept 100% of the proceeds. Shelor Toyota plans to give another car away in October 2015. The drawing was held on October 24, 2014 at Christiansburg High School. The winner of the Shelor Toyota Growing the Future Community Partnership Car Giveaway of a 2014 Mitsubishi Mirage is Dana Miano. Thanks to co-owner of Shelor Toyota , David Hagan who drew the winning ticket. Dana purchased her ticket from Floyd High School. “I am now able to give my 17 year old daughter a new car because of Shelor! This is a dream come true and I can’t thank Shelor enough”, said Miano. At halftime of the Christiansburg High School football game, Tony Ashe with the Touchdown Club at CHS gave a testimonial on how many ways that Shelor has helped the local schools. Local elementary, middle, and high schools sold 50,000 tickets at $1 each. Schools kept 100% of the proceeds. Shelor Toyota plans to give another car away in April 2015. The drawing was held on September 28, 2013, from 10:00 to 11:00 am at Shelor Toyota. Presentations from local school partners began at 10:00 and the drawing for the new Chevrolet Spark at 11:00am. The winner of the Shelor Toyota Growing the Future Community Partnership Car Giveaway of a 2013 Chevrolet Spark is Lori Higginbotham. Thanks to Christiansburg Primary School first-grader Parker who drew the winning ticket. Lori purchased her ticket from Narrows High School. After the Christiansburg High School choir performed, many testimonials from teachers, parents, coaches and administrators were shared. “It is great to see a company like Shelor Toyota investing in our most valuable resource — our children. Hearing the testimonials from teachers and administrators about the difference Shelor has made in their schools is inspiring, with fundraising opportunities like the Win A Car program, scholarships, and the annual talent show. They are encouraging our youth to excel and make a difference. Thank you to David Hagan and Shelor for being a great example to our communities”, said Higginbotham. Local elementary, middle, and high schools sold over 40,000 tickets at $1 each as a yearlong fundraiser. Schools kept 100% of the proceeds. If schools can sell over 50,000 tickets for the 2013-2014 school year, Shelor Toyota will giveaway two vehicles. 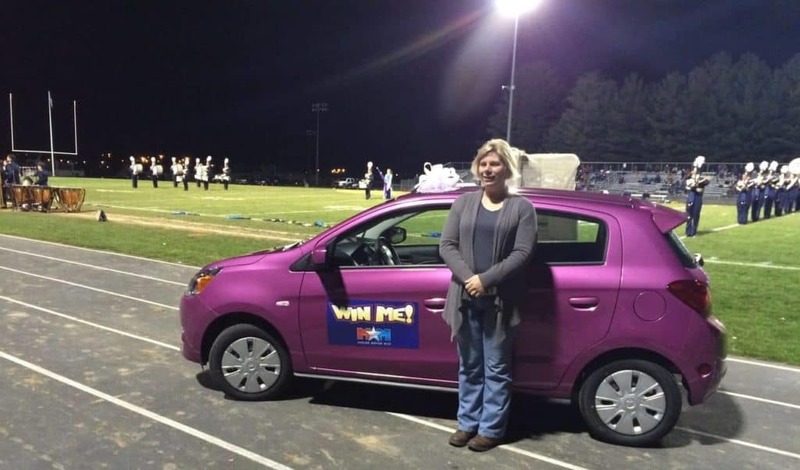 The winner of the Car Giveaway for 2010-11 was Sue Kass, a teacher from Blacksburg Middle School & the winner for 2011-12 was Belinda Blodgett. Shelor Toyota will continue this program again for the 2013-14 school year. The entire program is branded as Growing the Future: Community Partnership. All public schools in Montgomery, Pulaski, Giles, Floyd Counties and Radford City are invited to participate. Shelor Toyota’s commitment to local schools began over 10 years ago with the $1000 scholarship program for 10 graduating seniors each year. Three years ago, Shelor Toyota added a (1) donation program for student’s family and friends who purchase vehicles, (2) incentives for faculty and staff, (3) marketing materials for promoting this program, and (4) a fundraising program for a chance to win a new car. Over $400,000, in the past year alone, has been donated to elementary, middle and high schools in our area because of this program. Shelor Toyota considers this program: Growing the Future Community Partnership, an investment in the future by supporting education and children in our local communities. Shelor Motor Mile hosted the 6th annual Growing the Future Talent Show Finale on Saturday, November 4 at Christiansburg High School. Over $50,000 was awarded to students and high schools in Montgomery County, Craig County, Floyd County, Giles County, Pulaski County, and Radford City. 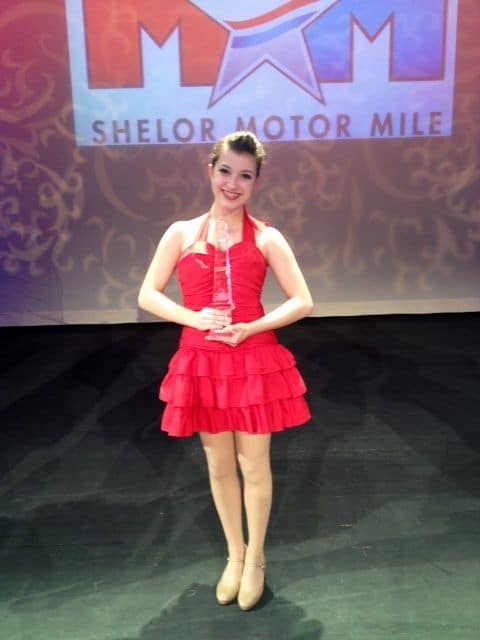 Blacksburg High School sophomore Jennifer Arogo performed a contemporary dance to Landslide and took home the grand prize of $15,000 for her school and $4,000 for herself. “This talent show was full of incredibly gifted young men and women. 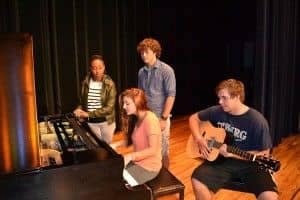 Thanks for letting them show off their talent and thanks for giving so much financial support to schools in the NRV,” said Tony Deibler, the Christiansburg High School principal. Two other high schools took home big money as well. Pulaski County High School senior Garrett Vance performed a classical piano comedy and took home second place. Garrett earned his school $10,000 and himself $2,000. Narrows High School’s junior Elena Maddy placed third with her Broadway performance of Journey to the Past from Anastasia. She took home $7,500 for her school and $1,500 for herself. Besides the cash winnings, all of the performers took with them experience, memories, and friendships. 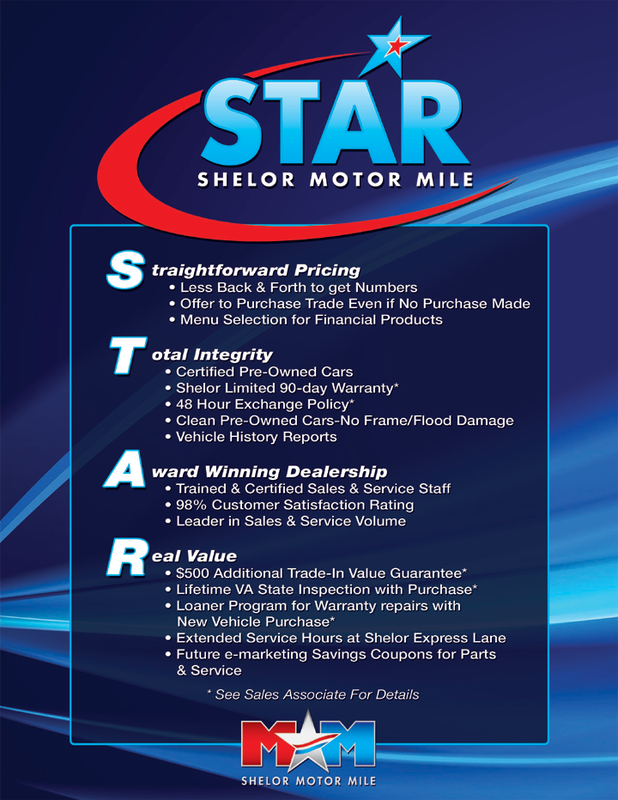 “I just wanted to thank Shelor Motor Mile for a wonderful evening. The talent was outstanding and the all of the schools will benefit from your generosity. Thank you for giving back to the schools and surrounding communities”, said Jason Mills, Principal at Giles High School. Shelor Toyota hosted the 5th annual Growing the Future Talent Show Finale on Saturday, November 5th at Christiansburg High School. Over $80,000 was awarded to students and high schools in the New River Valley and Craig County. A tie for 1st place was Christiansburg High School students, Rachel Hatcher, Alec Henderson, Zac Nelson, and Adam Williams who performed a vocal medley to various songs and Blacksburg High School student, Anna Jenkins, sang “On My Own from Les Miserables”. Both schools took home the grand prize of $15,000 for their school and $5,000 for themselves. Three additional high school students took home big money as well. Eastern Montgomery High School Student, Damian Claxton, took home third place winning EMHS $7,500 and $1,750 for himself. He sang and played the piano to “Purple Rain” by Prince. Pulaski County High School group “Fource” who consisted of Nathaniel Robinson, Briggs Robinson, Caleb Turpin, and Jared Mattson who performed a Jazz/Hip Hop Dance to “A Little Party” by Fergie. They earned PCHS $5,000 and $1,500 for the group. Christiansburg High School student, Karly Custer, played the piano and sang an original to “The Abyss” and took home fifth place. 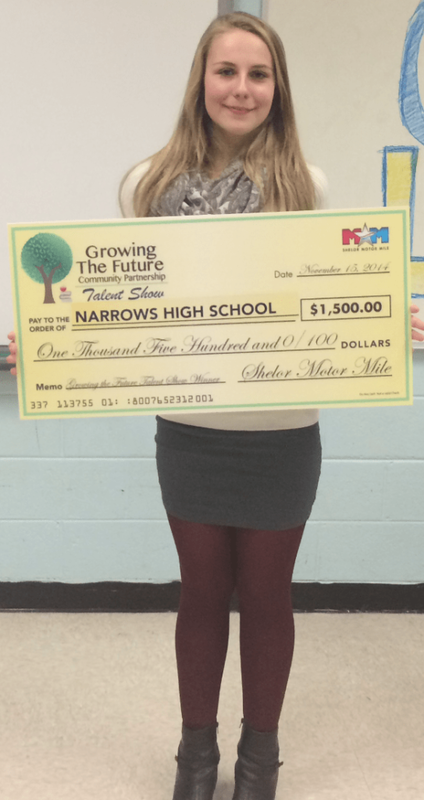 She won $3,000 for the school and $1,250 for herself. This makes a total of $18,000 that Christiansburg High School earned that night. “I just wanted to thank Melissa Epperly, David Hagan, and the Shelor organization and its supporters”, said Mandi Townley, Christiansburg High School Choral Director. “The Growing the Future talent is such an encouragement for the arts in our area, and has become a great venue allowing schools to cheer each other on. The financial support means so much to our schools, struggling to provide for all of our students educational needs”. Craig, Auburn, Giles, Narrows, Radford and Floyd County schools walked away with $2,000 for the school and all other student/groups walked away with $500. Besides the cash winnings, all of the performers took with them experience, memories, and friendships. Shelor Toyota hosted the 4th annual Growing the Future Talent Show Finale on Saturday, November 7th at Blacksburg High School. Over $60,000 was awarded to students and high schools in the New River Valley and Craig County. 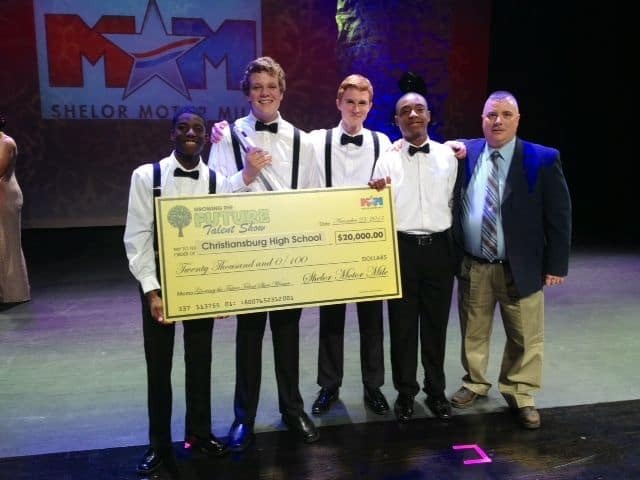 Pulaski County High School students, Tyler Weeks, Ian Jarrells, Brandon Atkins, and Alphonso Banian AKA “The Dunkard Bottom Boys”, performed a Vocal Comedy Ensemble to “Man of Constant Sorrow” and took home the grand prize of $20,000 for their school and $5,000 for themselves. “This is the first time I have experienced your talent show and I wish to tell you of the impressive job you did orchestrating this event”, said Scott Watson, Floyd County High School Principal. “Thank you for all of your efforts and thanks to Shelor for all of the care and giving that goes to the schools”. Three additional high schools took home big money as well. 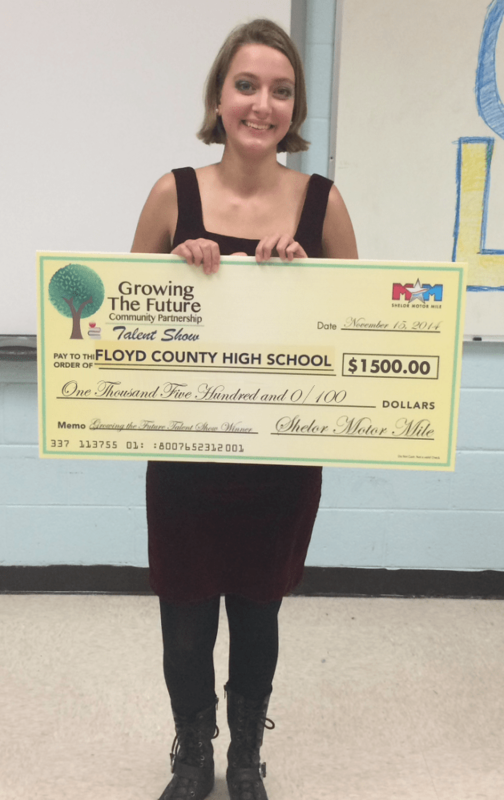 Blacksburg High School Student, Michaela Perdue, took home second place winning BHS $10,000 and $2,500 for herself. She performed a Hula Hoop dance to “Stolen Dance”. 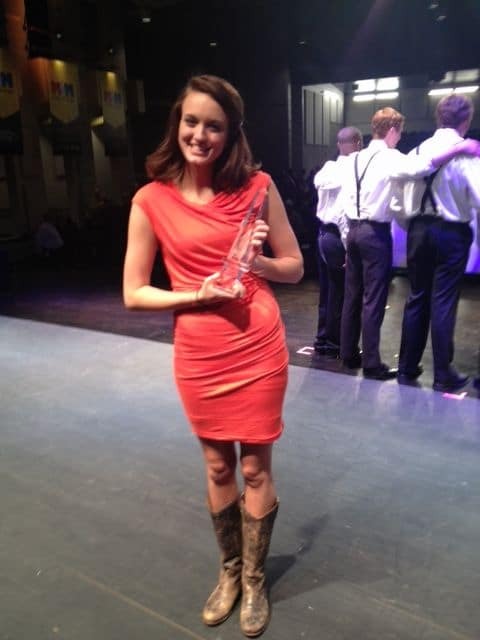 Pulaski County High School senior Moriah Hinton won third place with her vocal performance to “More than a Name on a Wall”. This is Moriah’s 4th year participating in the Talent Show and she has placed each year, earning Pulaski County High School $25,000 total. She took home $7,500 for the school and $2,000 for herself this year. Eastern Montgomery High School Student, Damian Claxton played the piano and sang “Let It Be” and took home fourth place. He won $5,000 for the school and $1,500 for himself. Craig, Christiansburg, Giles, Narrows, Radford and Floyd County schools walked away with $1,000 for the school and all other student/groups walked away with $100. Besides the cash winnings, all of the performers took with them experience, memories, and friendships. “I just want to thank Shelor for having this event. This event is such an inspiring thing to have for the community. I hope you all continue to have the Growing the Future events”, said Damian Claxton, the 4th place winner from Eastern Montgomery High School. “I’m still stoked that I was in 4th place! Thanks for helping the local schools. The money is going to help my school tremendously! I’ve already talked to the Principal and we have already started planning on what we want to do with the money and thanks to you guys we can now improve our school! I would like to thank God and everyone that made this event possible”. Shelor Toyota hosted the 3rd annual Growing the Future Talent Show Finale on Saturday, November 15 at Christiansburg High School. Over $60,000 was awarded to students and high schools in the New River Valley, Craig County, Giles County, and Radford City. 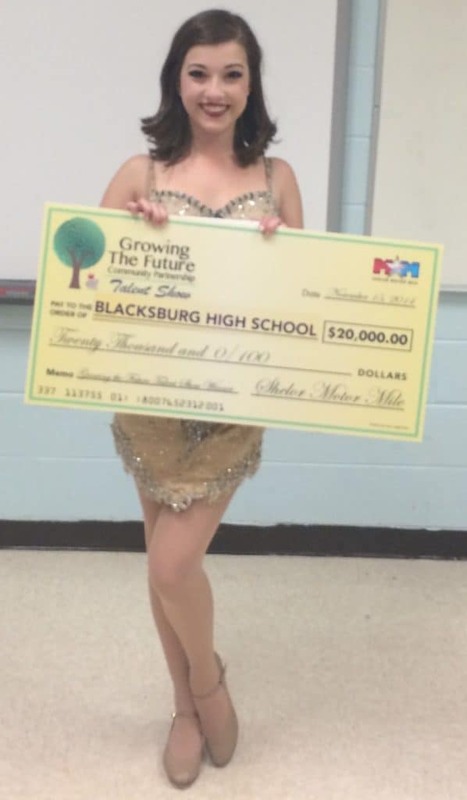 Blacksburg High School student, Morgan Arrivillaga performed a Broadway Vocal and Tap Solo and took home the grand prize of $20,000 for her school and $2,500 for herself. “This talent show was full of incredibly gifted young men and women. Thanks for letting them show off their talent and thanks for giving so much financial support to schools in the NRV”, said Tony Deibler, Floyd County High School Principal. Five additional high schools took home big money as well. 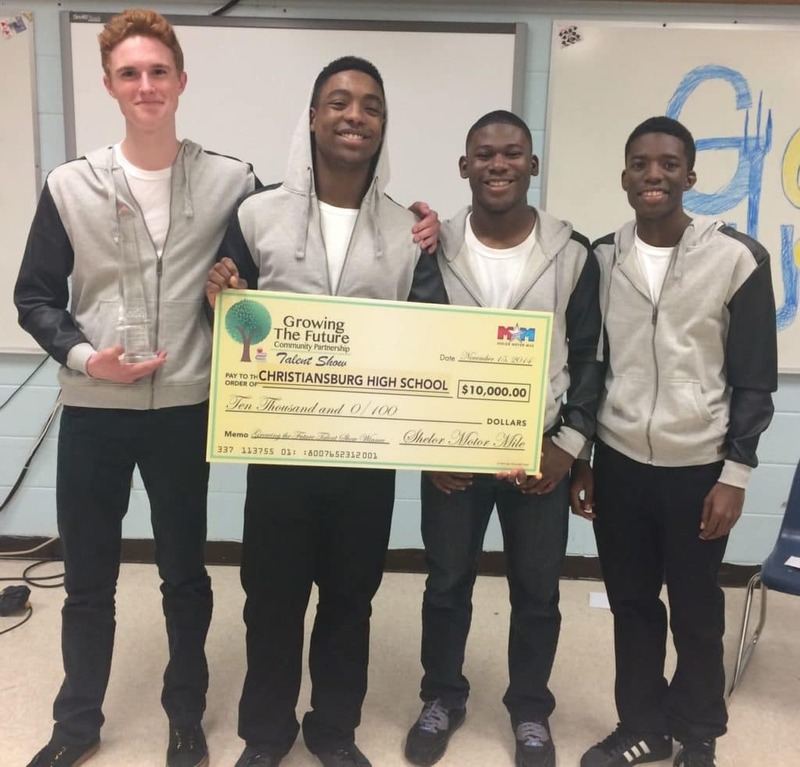 Christiansburg High School’s Acapella group, Aidan Everett, Simeon Brown, Ryan Watson, and Chet Morley took home second place winning their school $10,000 and themselves $1,500 total. They sang “Where is the Love”. Radford High School senior Avery Davis won third place with her fiddle and solo performance of “The House of the Rising Sun”. 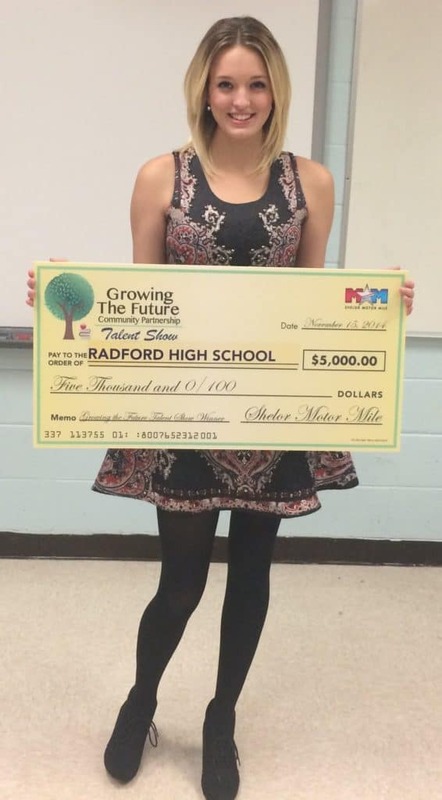 She took home $5,000 for school and $1,000 for herself. 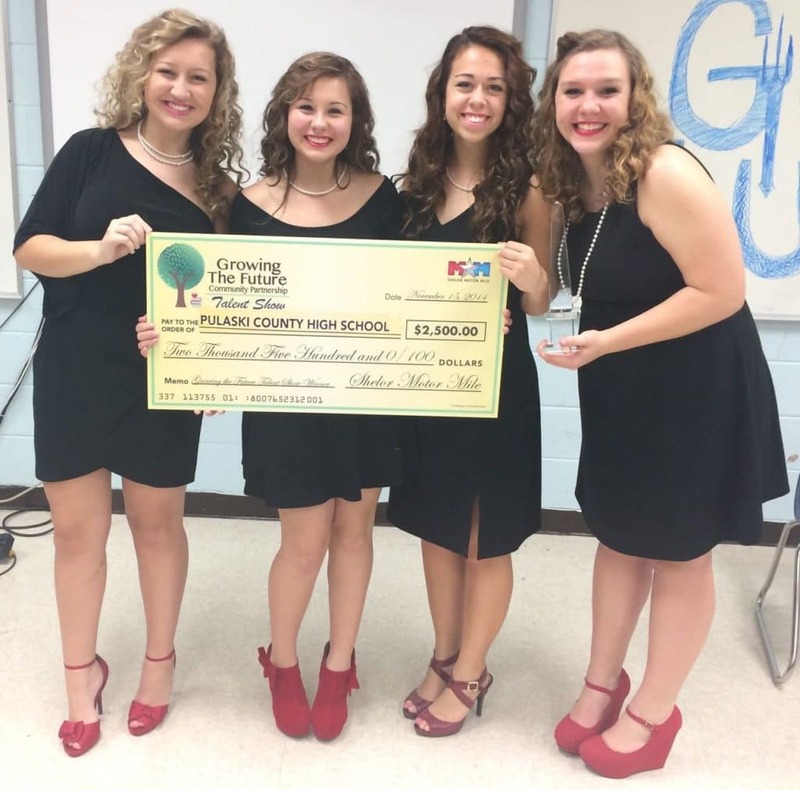 Pulaski County High School’s Acapella group, Lexi Eads, Maizy Landreth, Moriah Hinton, and Kelsi Hicks sang “Killing Me Softly” and took home fourth place. They won $2,500 for their school and $750 for themselves. Fifth place was a tie between Rebecca Reeves at Narrows High School that wrote a song called “Red Light” which she played the piano and sang. Laurel Brooke from Floyd County High School played the Fiddle to “Struck by Eleanor Rigby”. Both girls won $1,500 for their school and $500 for themselves. “I just wanted to thank Shelor Toyota for a wonderful evening. The talent was outstanding and the all of the schools will benefit from your generosity. Thank you for giving back to the schools and surrounding communities”, said Jason Mills, Principal at Giles High School. Three additional high schools took home big money as well. 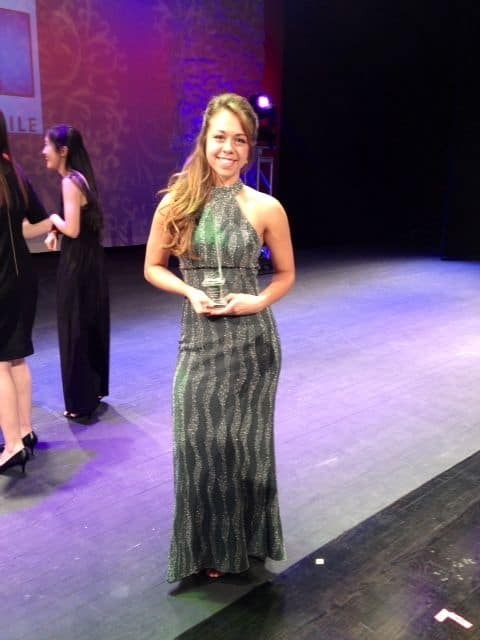 Blacksburg High School junior Morgan Arrivillaga took home second place winning her school $10,000 and herself $1,500. Morgan Performed a Broadway Vocal and Tap Solo. Moriah Hinton, a sophomore from Pulaski County High School, was back to the finale this year taking home $1,000 in third place and $5,000 for PCHS. She performed “I Won’t Let Go” by Rascal Flatts. Moriah took home second place in the 2012 Growing the Future Talent Show Finale. Radford High School junior Avery Davis won 4th place with her fiddle performance of “Orange Blossom Special”. She took home $500 for herself and $2,500 for her school. Christiansburg’s “Quadratonix,” made up of Caleb Caldwell, Leah Piemonte, Jessica Watson and Luke Williams, took first-place honors at the Shelor Toyota Growing the Future Talent Show on Oct. 20 at Christiansburg High School. The group’s performance of “Pop Smash-Up” won them $2,500 and $20,000 for Christiansburg High School. Friday that check was presented to the group in front of the entire Christiansburg High School student body by David Hagan of Shelor. Hagan handed a check made out for $20,000 to Williams and asked him what they were going to do with it. “We’re going to give to Dr. Siers and give it back to the school,” Williams said as handed the check over to school principal Dr. Kevin Siers. Siers said there had yet to be an official decision on how the school would use the money, but that repairing and upgrading the school’s auditorium would definitely be considered. He said he expects to soon form a committee to budget the money that will include school faculty and as well as members of “Quadratonix. “As for those members of the winning act, each agreed the accomplishment ranked among the highest of their high school career, however Caldwell, who arranged the piece along side Piemonte, pointed out that winning was never their real motivation for performing. “The thing is, we just do it for the fun of it,” Caldwell said. 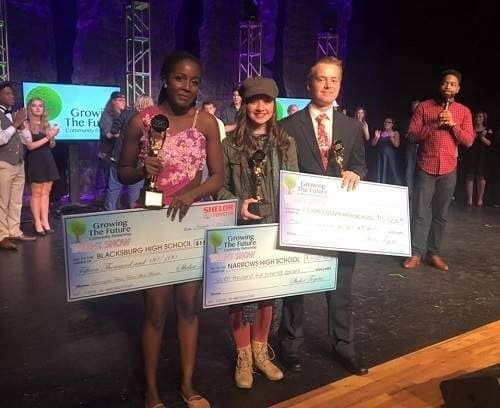 Moriah Hinton of Pulaski County High School took second place, winning $1,500 and $10,000 for her school, while Radford High School won $5,000 and Sara Davis $1,000 for her third-place finish. Megan Carlier won $500 and $2,500 for Blacksburg High School for fourth.